I appreciate it's been a little quiet around here for some time, for whatever reason. In general I just don't spend so much non-work time thinking about programming and other technical matters any more, which is probably healthy. But if you simply must read more of my ramblings, you'll be delighted to know I'm actively blogging in at least two other places. My work blogging cryptic crossword solutions and commentary at Fifteensquared continues apace and with pride, even after nearly five years. My posts are clustered around the weekends, and cover the various Independent crosswords, including the Beelzebub advanced cryptic, which I'm pleased to have reintroduced to Fifteensquared some time ago. Over at Three Hundred Beers, I'm also writing about another favourite pastime: beer. I'm working my way through Roger Protz's renowned book, 300 Beers to Try Before You Die, and jotting down a few thoughts on each beer as I go. I'm beginning think that while the introduction of PHP's newish DateTime object is very welcome, its implementation is one of the big missed opportunities in the language. This is because the decision was taken to make it mutable. In essence, DateTime has been implemented as an Entity rather than a Value Object. 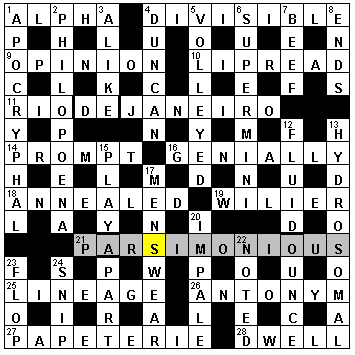 I really struggled with today's Independent cryptic crossword by Anax, and didn't come close to completing it, let alone spotting this. So it's only just now that I've learned that hidden away in the completed grid were the names of virtually all of the Independent bloggers at Fifteensquared. A rather humbling turn of events, I must say. It's not every day that one gets mentioned, however cryptically, in a national broadsheet. So many thanks to Anax, and maybe I'll persist in trying to finish one of your puzzles for a change! If you live in Britain, you need to read this. Even if you just live on this planet it's still ten minutes well spent. Writing in The Independent today, Johann Hari provides the clearest overview I've yet seen of why Cameron/Osborne's economic policy - that of "swingeing cuts" - is deeply ill-advised, is vindictive and will ultimately be disastrous for Britain. Johann Hari: Britain Just Became a Colder, Crueller Country - and for Nothing. I'm no expert in economics - I barely scraped an A-level in the subject - but even I can see just how wrong the policy is: decades ago John Maynard Keynes taught us how to survive a recession. Similar cuts in Britain in 1918, and more recently in Ireland, have shown us how not to, in spectacular fashion. Bewilderingly, Cameron and Osborne have chosen the latter route. Once you're done with Johann's article, and if you're interested in a little more of the economic theory behind the state we're in, then I can recommend reading Robert Skidelsky. His Future Generations Will Curse Us for Cutting in a Slump and By George, He Hasn't Got It: What Would JM Keynes Think of George Osborne's Budget? are particularly apposite. For a lengthier read, Skidelsky's eloquent biography of Keynes, named Keynes: The Return of the Master, is a skilful relation of Keynesian theory to the current crisis, in fairly layman-friendly terms. You may be pleased to hear that I'm unlikely to blog on the subject of economics a great deal in future, but I feel pretty strongly about all of this at the moment. Perhaps that's partly because, as a left-leaning liberal, I'm incensed that my vote has been misappropriated to help allow this to happen. But that's another story. This is just a quick heads up to point out that Tera-WURFL now has support for using MongoDB as its data store. This is particularly exciting for me, since I contributed the original code. I've been benefiting from Tera-WURFL for years now, so it's pleasing that our ongoing migration to MongoDB at work provided an opportunity to give something back. My most exciting technical discovery this year has been MongoDB. Mongo is proving to be a very satisfying solution to a lot of problems, so I'll no doubt be mentioning it here many times in the near future. MongoDB has support for stored procedures, which is great, but as a newcomer, I found it wasn't entirely obvious how to get started. I also found that the typically quite excellent MongoDB documentation tended to fall short on examples of the specific things I had trouble with. So here's a quick writeup of getting stored procs up-and-running in MongoDB. I recently had a requirement to enable a PHP application on Linux servers to connect to a remote Microsoft SQL Server database. Despite initial concerns that this was impossible or at least very difficult, compounded by numerous confused forum/blog posts suggesting it to be so, it turns out to be eminently achievable. Unfortunately, there seems to be a lot of misinformation out there, so at the risk of adding to it, here's my writeup of getting PHP on Linux to talk to an MS SQL Server database, using both the mssql_* functions and the Zend_Db component of Zend Framework.